Find out how I enjoyed my first package holiday for nearly 20 years when Mark and I visited Puerto de la Cruz on the island of Tenerife with Jet2 Holidays. Are you looking for a relaxing holiday in the sun with good food and beautiful surroundings but without travelling long-haul? If that sounds like your perfect break, then why not pay a visit to the city of Puerto de la Cruz on the north coast of Tenerife? It might not be right for you if you’re looking for long golden beaches or a thriving nightlife. But this beautiful city has a relaxed vibe, stunning scenery, and some fascinating places to visit. Until earlier this year, I’d only ever been on one package holiday. That was my wedding in Mexico in 2001, and since then I’ve always arranged my own flights and hotels separately. And while I enjoy doing the organising, sometimes it would be nice to have someone take care of it all for me. So when Jet2 Holidays asked if I’d like to experience one of their package holidays to the Canary Islands, I leapt at the chance. And when they said I could take Mark along with me, that was even better! Would my trip change my mind about package holidays? Read on to find out how we got on when we visited Puerto de la Cruz with Jet2 Holidays. 1 Why choose Jet2 Holidays? 5 Day Two: Exploring Puerto de la Cruz and the Botanical Gardens. 8 Day Four: Sitio Litre and Sunshine at last! With Jet2 Holidays, you can choose to fly from the UK to a wide range of holiday destinations. Flights leave from 9 UK airports including Belfast, Edinburgh and Newcastle, so you’re sure to find a holiday that appeals. For example, the choice of destinations from Birmingham Airport is as varied as Kefalonia, Dubrovnik, Majorca and the Venetian Riviera! A deposit of just £60 per person secures your holiday, with the balance due 10 weeks before you fly. And there are plenty of great offers to help you get the best price for your trip. The price of your holiday includes transfers to and from your resort, together with a generous luggage allowance of 22kg in the hold plus 10kg cabin luggage. And of course, the holiday comes with the reassurance of ATOL protection. The Canary Islands are a group of islands in the Atlantic Ocean. Although they lie just off the North West coast of Africa, the Canary Islands are territory of Spain. That means you’ll need to convert your sterling to Euros when you visit Tenerife. Tenerife is the largest of the seven main Canary Islands, and has a population of around 900,000. The capital city is Santa Cruz de Tenerife which lies in the south of the island. There are two airports in Tenerife, and Jet2 flies to the larger Tenerife South airport. Along with the other Canary Islands, Tenerife is a very popular destination for UK holidaymakers. The flight takes around 4.5 hours, and the islands lie in the same time zone as the UK, so there’s no need to change your watches. The weather is good all year around, and even in January you will get daytime temperatures around 19-20C. In the summer, the average temperature is around 25C so it’s generally very comforable. Our trip to Tenerife was booked for us, but there was still some pre-trip planning to do. You can check in online from 28 days before your holiday begins, which makes things quicker at the airport. You can add on additional bags, reserve your seats and order any hot meals that you want. We already had a generous baggage allowance of 22kg per person, plus 10kg of cabin luggage. So I simply reserved seats for us and also booked two hot meals for each flight. After that, it was just a matter of counting down the days til we set off for Tenerife! The first day of our trip started early when we left home in Shropshire shortly before 7am. Jet2 currently operate flights to Tenerife from 8 UK airports including Birmingham, Manchester and London Stansted. So I had opted to fly from Birmingham, as it is the closest and most convenient option for me. We drove the 45 minute journey to Birmingham International Airport, parked the car and headed into the terminal. The helpful Jet2 staff directed us to where we needed to drop off our suitcases at the check in desk. Although I’d overpacked for the trip, as usual, my case was still well below the 22kg weight limit. I had paid for express security so we didn’t get caught up in queues, but the airport was pretty quiet anyway. Our gate was soon announced and we went through to wait for our flight. When the flight to Tenerife was called, we were pleased to see that they called passengers forward in blocks. It made a nice change from the usual free-for-all that you often get on short haul flights. I’d booked our seats towards the rear of the plane, so we could sit back and relax while others boarded. When it was time for us to board, we quickly found our seats and settled down. The seats were comfortable, and we both felt there was a reasonable amount of leg room. Soon after take off, the hot meals were brought around to those who had ordered them. A small number of meals were also available if you wanted to buy one on the day. Mark had picked the All Day Breakfast for our flight to Tenerife, and I’d gone for the Beef Massiman Curry. My curry was very tasty, with big chunks of tender beef in a flavoursome sauce. And Mark enjoyed his breakfast, which looked pretty good from where I was sitting. Each meal also came with a bread roll and butter, some cheese spread and crackers, a really yummy chocolate sponge dessert, and a little Lily O’Brien chocolate mint. There was also choice of Tetley tea, Starbucks coffee or a bottle of water. On the way back, I chose the Peri-Peri Chicken while Mark had the Chicken Tikka Masala. On this occasion, I think that Mark made the better choice. My chicken was tender and the peri-peri sauce tasted good, but the potato wedges it came with were a little sad and soggy. On the other hand, Mark’s curry was very tasty with lots of chunky pieces of chicken. I wished I’d had that for myself and made him choose something else! The meals cost between £8.50 and £10. While I wouldn’t book them for a shorter flight, they made a nice change from an airline sandwich. After lunch, we sat back and relaxed. The flight to Tenerife took about 4.5 hours, so we chatted and watched downloaded TV on our phones. The drinks trolley came around regularly, and overall we both thought that the flight was very comfortable. The landing at Tenerife South was very smooth but it then took quite a while to get through security. When we finally got through passport control, we made our way to the front of the airport to the Jet2 staff. The flight voucher for our holiday included clear instructions on where to find them. The Jet2 staff gave us our welcome pack and took us to the bus for our shared transfer to hotels. The welcome pack included tips for our holiday, details of the excursions we could book onto, and handy cards with their contact details on. They explained that we’d be able to find details of our return pick up at the hotel. And while the days that Jet2 staff visit the hotel may vary, they’d always available by phone if we needed them. The bus travelled through the lunar landscape of Tenerife, under a leaden grey skey. There were even a few spots of rain along the way. It all felt quite unfamiliar, and not exactly what I had been expecting. “I don’t think we are in Kansas any more…” I thought to myself. The journey took around an hour, and it was a comfortable ride along major roads. The rain stopped as quickly as it had began, and soon the sky started to lighten. The bus driver was playing 70s disco music throughout the journey, which made Mark and me laugh. As we drew closer to Puerto de la Cruz, the landscape started to become a little greener. Vast fields of banana trees stretched out at the side of the road, along with large Canarian palms and strange-looking dragon trees. Our hotel was the last on the route, so we got to see the hotels that the other Jet2 Holiday guests were staying at. They all looked pretty decent from the front entrance! Finally, the driver dropped us off at our hotel, and we went to check in. We would be spending four nights at the Sol Costa Atlantis, a four star hotel close to the sea front. It has a pool, spa and fitness centre, and the location makes it ideal for exploring the city. We checked in at reception and headed up to our room on the 7th floor. Our room was spacious, with cool neutral colours in the decor. The Superking sized bed was very comfortable, and all of the rooms at the Sol Costa Atlantis have free, reliable, high speed WiFi. You can find out more about our room at the Sol Costa Atlantis in my full hotel review here. After settling into our room, we went for a quick drink in the bar before dinner. As our holiday in Tenerife was on a bed and breakfast basis, the package didn’t include dinner. But you can dine in the hotel for an additional charge, so we decided to eat in the restaurant on our first evening. The hotel’s buffet style restaurant has plenty to choose from, and you can also have fish or steaks cooked to order. You can read my full review of our dinner at the Sol Costa Atlantis here. After dinner we went out for a short walk into Puerto de la Cruz. By then the sun had set, so we couldn’t see much of the coastline, and we were both feeling pretty tired after a long day of travel. So after a short stroll and a look in some of the shops, we headed back to our room. I knew there would be plenty more time for sightseeing over the next three days! Day Two: Exploring Puerto de la Cruz and the Botanical Gardens. We got up early the next day and headed straight down for breakfast in the hotel’s restaurant. The choice in the hotel’s buffet style restaurant was very wide, with something to suit all tastes. Whether you like coffee and croissants, fresh fruit and prosecco, or even a full cooked breakfast, it was all covered. In fact, it took me a while to decide what to have, but I finally settled on a hearty cooked breakfast. Sausages, bacon, spanish omelette and plenty of coffee set me up for a very full day ahead. You can find out more about dining at the Sol Costa Atlantis in my full hotel review here. Afterwards, we headed into town to look around. The sky was still fairly grey and the temperature was a cool 18C, ironically the weekend before had been much warmer! But it was still warm enough to walk around in t-shirts without needing a jacket. The beach was covered with black lava sand and huge black rocks, while dragon trees and palm trees dotted around the promenade. And the sea was pretty rough, with large waves rolling in off the Atlantic Ocean. There was no chance of me going for a swim in that water! But the fresh sea-salt air was packed with masses of ozone and I breathed it deeply into my lungs. I’m never happier than when I’m by the sea, and this city was already starting to make me feel very happy! We walked past the Lago Martiánez, an open air swimming pool complex which looks out over the sea. It was designed by the famous local artist César Manrique from Lanzarote in the mid-1970s. He used elements of traditional Canarian architecture and native flora in his design, and you can see some of his large pieces of sculpture from outside the park. The large artificial lake at the heart of the complex is surrounded by smaller pools, gardens, restaurants, and terraces filled with sun beds and parasols. The complex was fairly quiet on the first two days of our visit, but got busier towards the end of our stay. We didn’t go into Lago Martiánez this time, so that will have to wait for our next trip to Tenerife! Before our trip began, people told me that Puerto de la Cruz is less developed and more traditional than the resorts in the south of the island. And I was thrilled to discover that this is absolutely true. I loved the traditional colonial Canarian style buildings with their wooden shutters and balconies. Some of the buildings I saw had been turned into shops or restaurants, like the Starbucks in the picture. But I also fell in love with the little single storey houses, painted in a rainbow of bright colours. And Puerto de la Cruz also feels very green, with the city’s squares filled with exotic plants and towering palm trees. Puerto de la Cruz has a lovely laid-back vibe, with cafes and tapas bars everywhere you look. Even in early March, you’ll see people relaxing outside over a bite to eat or a cold drink. The difference is that in March, it’s a few degrees warmer than even the southern-most regions of Spain! So we decided to join in and indulge in some tapas for lunch. I really enjoyed the almagrote, which is a speciality from the neighbouring island of La Gomera. It’s a spicy paste made from grated hard cheese, and is delicious served with slices of toasted bread. Mark loved the ‘Carne fiesta’ which was tender pieces of grilled Iberican pork served with red mojo. This red sauce is a Tenerife speciality and you’ll see it on menus wherever you go on the island. We loved it’s fiery flavour! And I was pleased to see that non-alcoholic beer is widely available in Puerto de la Cruz. The prices for eating out are very reasonable as well. We shared five tapas with bread and two drinks each for less than 35 euro. Our next port of call was the Botanical Gardens of Puerto de la Cruz. So we picked up some drinks from the small supermarket across the road from the hotel and headed off. Our route took us along the Avenida Aguilar y Quesada and up a long steep hill to the Botanic Gardens. The walk from the Sol Costa Atlantis took about 25 minutes, but you could easily take a taxi if you don’t fancy the lung-busting walk. The Botanic Gardens first opened in the late 18th century and is full of exotic tropical and subtropical species. It’s quite small, covering around 7 acres, so you can easily walk around in a couple of hours. I always love visiting botanic gardens, and this one was particularly interesting as it was so different to those I’ve visited in the UK. Plants and trees that I’d only ever seen in glasshouses in the UK grow happily outdoors over in Tenerife. The garden was very peaceful, apart from the sound of the birds in the trees. As we wandered along the pathways, we spotted exotic flowers like the bird of paradise flower (Strelitzia reginae). This is a popular houseplant in the UK, but originates in South Africa, You’ll see them all over the place in Puerto de la Cruz. But for me, the most intriguing specimen was the massive 200 year old fig tree (Ficus macrophylla columnaris). Although it looks like a densely packed group of multiple trees, this is in fact one massive tree. The tree sends down aerial roots from its branches and when they reach the floor, they take root and thicken up to provide another supplementary trunk. It’s an awe-inspiring sight, and visitors to the garden were obviously entranced by this remarkable tree. Entrance to the Botanic Garden costs just 3 Euro for adults, and I highly recommend it for anyone with an interest in gardening. After we had worked our way around the whole of the garden, and I had taken several hundred photographs, we made our way back down to the hotel for a short rest before dinner. So we spent a long time walking around Puerto trying to decide where to eat. Some of the smaller restaurants were packed full, like Restaurante El Camino and Bodega Julian. Both of these get great reviews on the internet, but we weren’t able to get a table. We also found that in March, Puerto de la Cruz starts to close earlier than we expected. In fact, by 9pm some of the restaurants were starting to wind down. We called into Restaurante Rustico by the sea front, but they said we were ‘a bit late for dinner’. So more tapas was the order of the day. This time, our order included roasted local fish with mojo sauce, and a really delicious mini burger that was charred beautifully on the outside and very tender and juicy within. And of course, more of that fantastic almagrote with bread. 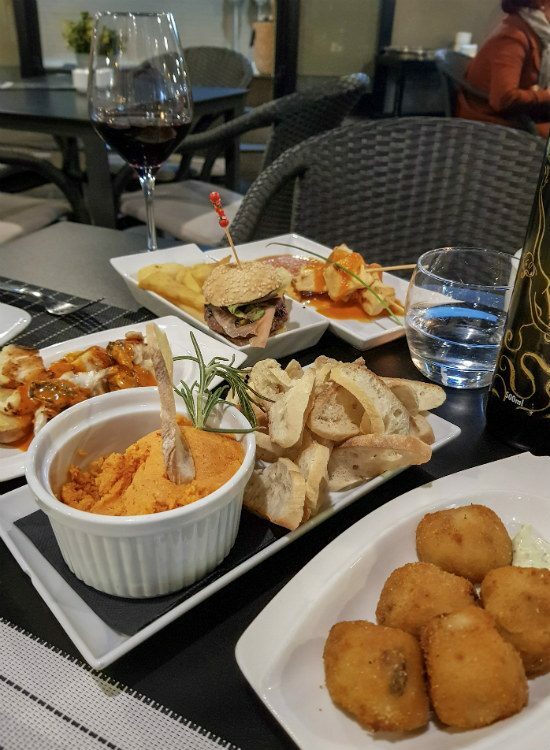 We found that the Grupo Compostelana group of tapas bars are a good choice for a quick fix of tapas. You’ll spot them dotted around town, easily recognisable with their blackboard signs outside. Each one has a different menu but the food is delicious, and the service is quick and friendly. You can get a decent lunch or light dinner for two for around 30 euro including drinks. After our dinner, we headed back to the Sol Costa Atlantis. We’d walked over 24000 steps that day, and were sure to sleep well that night. After our full-on day of sightseeing, we decided on a slightly later start to Day Three. The weather was better than the previous day but it was still a little cool. I really hoped that we would get to see some blue skies during our stay in Tenerife. You don’t expect to go to the Canary Islands and not see the sun! After breakfast, we headed out to follow the street art trail around Puerto de la Cruz. We discovered later that you can download a map showing all of the street art, but we just took a photograph of a sign that we found in town! It was really interesting to see the art in many fascinating styles, and the trail took us into areas of the city away from the sea front that we might not otherwise have seen. It also allowed us to see more of the city’s architecture, and more of those lovely brightly coloured houses. And we saw more of the town’s squares with churches, statues, and coffee shops, that are so peaceful and relaxing during the day, but start to come alive at night. It took us a couple of hours to wander slowly around the street art trail, so then we wanted to get a quick lunch before heading off to the Sitio Litre Orchid Garden. Now, I wouldn’t normally go to McDonalds for lunch when I’m away a trip. Don’t get me wrong, I’ve got nothing against a trip to the Golden Arches in the UK. But abroad, I usually prefer to steer clear of multinational chains in favour of meals with more local flavour. But on this occasion, we decided that it was probably our quickest and easiest option. So we popped into McDonald’s and were surprised by some of the options not available in the UK. We ended up ordering our fries with spicy brava sauce and garlic mayo to eat with our burgers. And you can even get an alcohol-free beer in there! After our speedy lunch, we started on the walk up to Sitio Litre. It’s a shorter walk than the one to the Botanic Garden, but the route takes you up a leg-burning steep hill. We stopped at the top to get our breath back and then approached the entrance. Or to be precise, closing in 30 minutes. I felt like crying after walking all the way up that hill, but there was nothing to do but to turn around and head back down. After all of that, I decided that we’d done enough walking for one day, and we went back to relax at the hotel before dinner. I was very grateful for the refreshing fruit-infused water that the Sol Costa Atlantis provide free of charge in the foyer! If being by the sea is my happy place, then eating in a restaurant overlooking the sea is even better. So we decided to try Restaurante Rustico, which was one of the places that we were too late to get into on the previous evening. It’s a lovely little restaurant looking out over the rocky coastline of Puerto de la Cruz. The view was stunning, and our meal was accompanied by the sound of waves crashing over the rocks. For our first course, we shared two starters. The first was a plate of mixed croquetas, served with a creamy cooling sauce. And the second was thick slices of grilled local cheese, served on a sizzling hot plate with slices of toasted bread. One slice was topped with red mojo, another with green mojo, and the third with local honey. The combination of the mild, melting cheese with the red spicy mojo was delicious, and I really enjoyed the sweetness of the cheese with honey. I wasn’t quite so keen on the green mojo, but it’s always good to try out new foods! Now, I always love eating freshly caught local fish. In fact, it’s one of the main reasons that we keep on going back to the same fishing village in Portugal. So despite the wide choice of meat dishes on the menu, we both picked local fish for our main courses. Mark chose the donkey fish, which is quite a firm, meaty fish. And I went for parrot fish, a Canarian favourite which was more delicate both in flavour and texture. Both of the dishes were really delicious, but I think I actually preferred the donkey fish. And we had to order wrinkled potatoes with red mojo to eat alongside. These are a local speciality and absolutely delicious – if you visit Tenerife, you must try them! The potatoes are boiled in salted water until they are just cooked. Then the water is poured off and the pan put back on the heat so that they can steam dry. The skins wrinkle as they steam and they are left coated with a white salty residue. Meawhile the waxy flesh inside is firm and full of flavour. These were absolutely fantastic, and I definitely plan to try cooking potatoes this way at home. And the spicy mojo sauce gives a perfect contrast to the potatoes. We were both quite full after our main courses, so we ordered coffee instead of desserts. Our meal came to just under 70 Euro including two courses for each of us plus two drinks each (red wine for Mark, alcohol-free beer for me), water and coffees. Whour coffees we meandered slowly back to the hotel, with plans to try again for Sitio Litre the next day. Day Four: Sitio Litre and Sunshine at last! I woke up bright and early on my final full day in Puerto de la Cruz to find that the sky was blue and the sun was shining. So we dashed downstairs for a quick breakfast and headed out into the sunshine. Our first stop was to go and sit by the sea, soaking in in the sun and sea air. The town looks so pretty in the sunshine, and it was full of people enjoying the weather and getting ready for Carnival. We missed out on this by just a few days, so if you’re planning to visit Puerto de la Cruz in March, it’s worth checking the dates before you book. After basking in the sun for an hour or so, we headed off for our second attempt at visiting Sitio Litre. I made sure to check first that it was open on Sundays. After all, I didn’t want to get all the way up that hill and find it closed again! But yes, the garden opens on Sunday so we walked back up the Avenida Aguilar y Quesada and then back up that steep hill. At the top of the hill, thighs burning, we finally paid our entry fee to get into Sitio Litre. It was just 4.50 euro for adults, such a bargain. Sitio Litre means ‘Little’s place’ and this is the oldest surviving garden in Tenerife. The house was built in 1730 and then was bought in 1774 by Archibald Little, who planted the gardens. The house was sold to Charles Smith in 1856, and stayed in his family for the next 140 years. Famous visitors to the house and garden include William Wilde, father of Oscar Wilde, and Agatha Christie visited in 1927. She was holidaying in Tenerife to escape the publicity after her famous disappearance. I was amazed by this garden. It’s a real haven from the city, but is packed full of the most gorgeous plants. It’s very different to the Botanic gardens. They both have beautiful shaded walkways, but Sitio Litre is also awash with colour like the bougainvillea. There’s even a croquet lawn! It was fascinating to see succulents used as bedding plants, and orchids growing in out in the open air (in a carefully shaded spot of course). You can also stop for a refreshing smoothie in the Orchid cafe. They are served icy cold,and it was just what I needed especially after walking up that hill! I loved the garden, and really recommend a visit when you’re in Puerto de la Cruz. It’s well worth the walk up the hill! When we’d finally finished walking around Sitio Litre, it was time to head back down into the town. The sun was high now, and the temperature starting to rise. So we took a slow walk back down through a park, stopping for a short while in the shade of the palm trees. We shared a pizza for lunch, which had an excellent crispy base and plenty of topping. With a drink each and water to share, our final lunch in the city came to less than 20 euro. Throughout our visit, I was really impressed by how inexpensive Puerto de la Cruz is. Combined with the excellent weather and relaxed atmosphere, I can see why so many people choose to retire here. It also makes Tenerife a great choice for a budget-friendly winter break! Back at the hotel again, we spent the afternoon relaxing on the terrace at the hotel. After all of our sightseeing, it was good to make the most of the good weather and catch up on a little work. And then all of a sudden it was our final evening in Puerto de la Cruz. There was time for a quick tapas dinner (yes, more almagrote!) and then we spent time walking along the seafront, listening to the roar of the sea. I was glad to be heading back home to see my family agaain. But I also knew that I would really miss Puerto de la Cruz. The final day of our trip started in relaxed fashion with a late breakfast. We packed up our luggage and prepared to check out at about 11.15.am. Our transfer was due between 11.30am and 12pm but the hotel would store our luggage securely for us if necessary. The coach turned up for us just after 11.30 and we headed back towards the airport, collecting other customers on the way.. I craned my neck to catch a last glimpse of the beautiful Puerto de la Cruz shoreline before the road took us back inland. The landscape which had looked so strange five days ago now felt familiar and welcoming. Back at Tenerife South airport, our check in was easy, and boarding ran as smoothly as in the UK. And we enjoyed excellent service throughout the flight home, landing safely back in the UK around 8.30pm. I have to admit that I didn’t love Puerto de la Cruz immediately. The landscape felt completely alien to me at first, and the town felt a little too quiet on our first night on the island. But over the course of our holiday, I fell head over heels in love with this town. It has a very relaxed atmosphere, and there’s lots to see and do. In fact, there’s still more to do that I didn’t manage to fit into this short break. We would have loved to take a day trip to the Teide National Park, and journey by cablecar to the peak of El Teide, the highest mountain in Spain. And I know that if we come back with our teenage sons, they’d love to visit Siam Park, with its amazing water shutes. I was also very impressed with our Jet2 Holidays experience. The online check-in was very straightforward, and it was easy to book meals and seating for the flights. Our experience on both of the flights was excellent, and the staff who greeted us inTenerife were really friendly. I really enjoyed my first package holiday in nearly two decades. And while I’ll still be planning most of our travel myself, we will definitely be considering a Jet2 Holiday in the future. In fact, I’ve already been browsing the website since we got back! Thank you to Jet2 Holidays for inviting us to visit Tenerife, and for a wonderful trip! I’ve been the north of the island but many years ago. After reading this and seeing your photos I think I’d like to make a return visit to a more authentic side of Tenerife. It’s such a lovely place to visit, definitely worth a visit!